Osoyoos is a child’s playground. There are so many fun and exciting activities for kids of all ages (including those kids at heart!). Up the hill from downtown lies the Nk’Mip Desert Cultural Centre, one of B.C.’s most unique ecological and cultural centres. Take a self guided tour through the facility while you learn about the history, stories, and culture of the local Okanagan people. During the summer months, visitors can participate in a number of interpretive programs such as cultural performances (which can include traditional Okanagan singing, dancing or stories), guided tours, or a live snake show! The Osoyoos Desert Centre is a 1.5km boardwalk through our unique Canadian desert landscape. There’s also an indoor interpretive centre, with hands-on exhibits for the kids and fun facts to discover about the local ecology and wildlife, and a native plant demonstration garden to explore. Trained interpretive staff and friendly volunteers are on hand to share information, answer questions, and explain what’s being done to save the unique desert habitat. You and the family can start at Rattlesnake Canyon. But before you get frightened off, it’s not a dried up canyon where you’ll find an occasional Rattler. Rather, it’s a Western-based Amusement park, located downtown, where children can let their imaginations run away with them. Here you’ll find a western mining town themed amusement park that offers quality entertainment at affordable prices. Enter the grounds and you’ll find an 18 hole mini golf course, a Go Kart track consisting of 12 single karts and four double karts, an ice cream parlor in an authentic windmill, an arcade, bumper boats, a tumble whirl, bungee tree, a 35 foot rock climbing wall, gift store, tattoo parlor and a concession stand. It’s pure entertainment and fun for kids of ALL ages! Step into an unforgettable, world-class, miniature fantasy world. The Osoyoos Desert Model Railroad is a must-see miniature world with up to 45 trains running through very detailed landscaping with European style towns and houses. With 1,600 buildings & 25,000+ hand painted little people adorn this 371 sq m (4000 sq ft) attraction. There’s a reason they’re rated as the #1 thing to do in Osoyoos on Trip Advisor. One of the best places to be on those hot sunny summer days that Osoyoos is so famous for! Grab the kids and head on down to the Osoyoos Waterslides! With 5 slides to ride, it’s a great way to spend a hot Osoyoos day! Explore Canada’s only desert on horseback with Sun Hills Riding Centre! Take a 1 hour guided trail rides past stunning valley views overlooking orchards, vineyards and Osoyoos Lake. Their horses are suitable for even the most inexperienced riders. Little Lily on Geronimo was very nervous to go on her first real ride on a real horse all by herself. But once we got out in the desert and she learned that she was in control of and could communicate with such a big animal, it was all smiles and her confidence soared. That's the most rewarding thing to us guides, to see the positive changes that horses can give to anyone, no matter the age. And for slighter older youth, hitch up a horse at the Indian Grove Riding Stable for a guided tour on horseback on the mountain trails that meander through the Osoyoos area. The half-day and full-day tours include riding, taking a break for fishing, exploring a nearby waterfall and then having a dinner on the trail. Safe, horseback trail rides through the Osoyoos desert and along mountain trails provide a safe cowboy adventure with spectacular views and breath-taking trails. Want to cool off on a hot summer’s day? 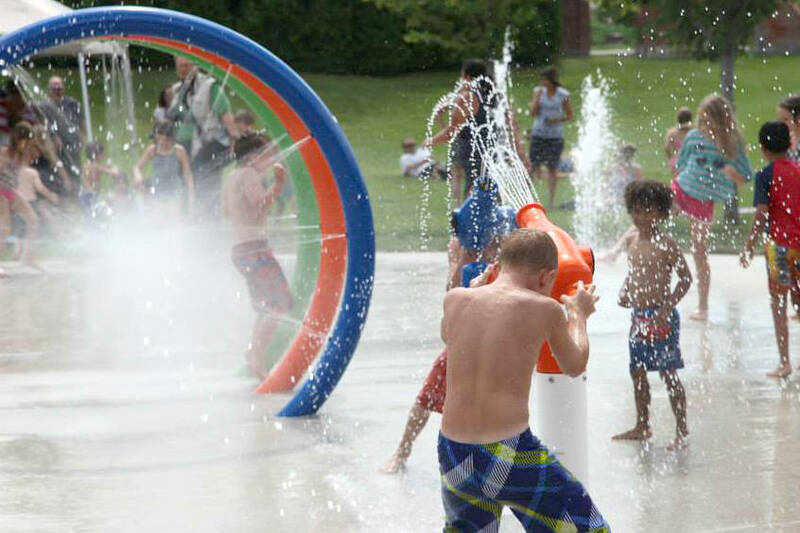 Let the Osoyoos Splash Park do that job with young kids turning water cannons on one another while parents relax watching the kids burning off energy. Click here for directions to the Osoyoos Splash Park. Another great option for the whole family is Lions Park beach and playground! Less busy than Gyro Park, Lions Park offers a great playground for the kids as well as lots of shade and trees and a wonderful beach. A great spot to spend the afternoon, or pack a picnic lunch. Click here for directions to Lion’s Park in Osoyoos. Installed in 2018, this new playground features all natural elements, and the objective of the playground is to encourage imagination and provide a deconstructed, free form of play. Kids (of all ages) will enjoy exploring this new playground and the adjacent soccer field and nearby splash park. 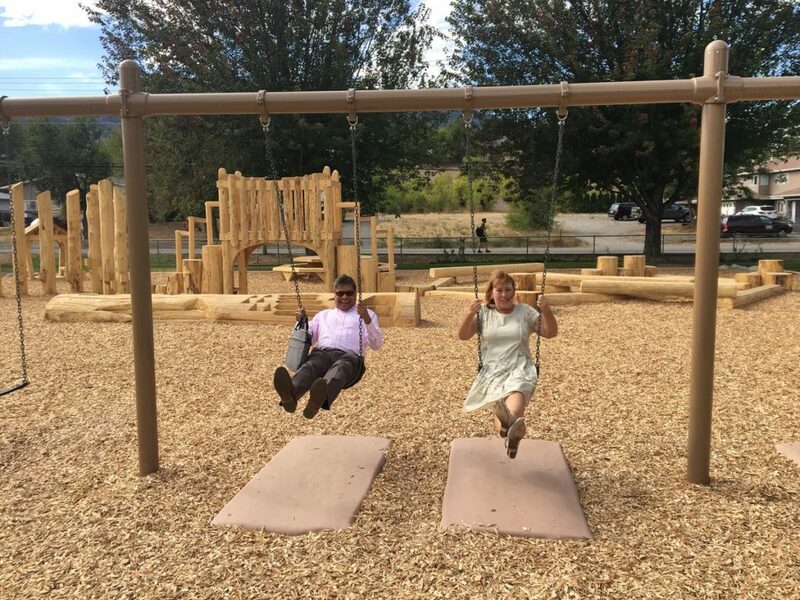 Click here for direction’s to the Osoyoos Elementary School Natural Playground.